For me, what I love about Eight Minutes Idle is the rich description of how a call centre operates with all its politics and contradictions. Given that the call centre is now an established and central feature of our lives as workers, or more often callers does it surprise you that the call centre is conspicuous by its absence in literature and film and does this make it even more important to have an authentic representation of what it is like to work in a call centre such as in Eight Minutes Idle? Absolutely. I’ve recently been going through the novel again for the ebook edition and I noticed in it that a couple of times Dan makes reference to a call-centre providing such rich material that he’s sure it’s only a matter of time before it appears in films and on TV. I think this was me covering myself in case other call centre narratives showed up before the book was published, but although it’s appeared occasionally in films and novels, it never seems to be described in much depth. It’s generally presented as a job a character has while doing something else—as if it’s something that doesn’t require all of your attention. But when I was working in a call-centre it took all of my attention and started to shape the way I was looking at the world, which was what I wanted to get across in the book (and now in the film). One of the main issues call centre workers tend to express dissatisfaction with is their management. Managers, who listen-in to calls, enforce targets and who have the power to fire tend to be regarded as straightforward villains, which is indeed how they have been portrayed in fiction elsewhere. Alice, the Team-leader in Eight Minutes Idle, however, seems to be a more complex character who exhibits vulnerabilities and is also subject to pressures. Could you tell us some more about the character and how this relates to call centre managers in general – is she as much caught-up in the call-centre system as everyone else? Alice in the book and Alice in the film are slightly different characters, who have quite different journeys—but both are complicated people who are not straightforward villains, as you say. Alice in the novel has started working in a call-centre when she’s left school at sixteen and has initially been quite excited about the job but has now reached the point where she’s started to feel frustrated in her position. She’s had a relationship with her superior that hasn’t quite worked out and enters into a relationship with Dan partly as a way of winning back the approval of her team but mainly because she wants a friend. She sees all the fun the gang are having and doesn’t understand why being their team-leader should exclude her from this, especially as she used to be a rebel herself. But then she can’t help herself from stirring up trouble with the team. In the film, Alice is still vulnerable but she’s a little bit more proactive. Her relationship with Bryan is breaking down, the call-centre’s is in trouble and she is more immediately attracted to Dan, and jealous of his friendship with Teri. I think Montserrat Lombard has done a really brilliant job of bringing Alice to life and you see her thought- processes more clearly in the film than perhaps you do in the novel. Because the novel is in the first person, Alice is generally seen though Dan’s eyes, and sometimes his understanding of her is slightly at odds with her true character. Overall the main character, Dan, seems to be content with life in the call centre, though achieves this through a sense of detachment. Is this a reflection of your own feelings from your time working in a call centre and how, for instance, would you feel about working in a call centre such as Quick Kall now? Working in a call-centre was one of my first jobs after leaving university and I genuinely really enjoyed it. I started out doing the day shift and I really liked being surrounded by other people mainly the same age as me and it was my first experience of office camaraderie. Then after a while I started doing the night shift and that was a much more peculiar experience. I took the night shift because it was a 24 hour line and hardly any calls came through so I could use the time to write, but call centres at night are strange places. Which led to the idea of sleeping in them, which inspired the novel. Some of Dan’s observations, especially seeing his father coming back from an office job as a kid and trying to imagine what it was like, are definitely how I felt. (Mind you, this was partly because whenever I called him he seemed to be taking advantage of the full-size snooker table in the rec room.) Writing novels requires so much sitting alone in a room that office banter and fun feels really desirable. That said, I now also teach Creative Writing at a university so have a newfound sense of how boring meetings can be and the occasional downsides of work. I think what I was trying to get at in the novel (and the film) is how much of life is taken up with work but how few people try to replicate this (I guess because most writers don’t have that much experience of day-to-day office life) in books or film. I think I would miss writing if I worked in a call-centre full time again but equally I do miss that sense of having a gang which you don’t really get at universities in the same way. Everyone is so isolated in that sort of environment because they’re all working on their own research (or novels, in the Creative Writing department) and what I liked about working in a call-centre is that you’ve all doing more or less the same thing, and helping each other out and it’s up to you how seriously you take it (or your manager). One of my favourite scenes in the novel is where Dan is in the elevator and joins in the conversation about the abolition of the call centre. Much has been made of how technology, particularly the use of the internet, will either erase, or alter the call-centre’s core raison d’etre. However, very little seems to have actually changed. In fact my own experience of working in a similar call centre some ten years after Eight Minutes Idle was first published is virtually identical. Has Dan been proved right – have call centres been kept around as a public service simply to listen to old people complain? Well this has been very much on my mind, first with adapting Eight Minutes Idle into a film (I co-wrote the screenplay with Nicholas Blincoe) and then preparing the first e-book edition. I hadn’t looked at the book in the meantime and had completely forgotten the conversation in the lift and it came as a surprise to me to read it again. When we started working on the film the first thing we had to decide was whether to do it as a period piece and set it in the late ‘90s as the novel was, or to update it to the present day. And before we made the decision to update it we looked around and decided that not much had changed with call-centres. There was one subplot in the film that got edited out about how some companies believe that employing a call-centre is an admission of weakness (I found interviews with people talking about this online), but there is another element in the film that does relate directly to this question that I don’t want to give away as it’s a surprise and not in the book, but essentially I think Dan has a point. There are some differences now, with people being more proactive about complaining when things do wrong—some people will go on Twitter for example and try to contact service providers directly, and the fact that this is happening in a public forum sometimes makes companies more likely to respond—and companies often trying to hide the fact that they even have (or make use of) a call-centre. But essentially I think that even the most complicated computer systems in the world can’t answer the range of questions that people need answering. Niels Kjellerup coined the phrase “toxic call centres” to describe call centres with a high focus on call volumes and average handling times which also exhibit a high level of staff-turnover. Can Quick Kall be called a “Toxic Call Centre”, or is this unfair? I’m looking forward to hearing what you think of the film because I think Quick Kall in the film is very much a “Toxic Call Centre” even down to the way it looks—it’s not a normal-looking office environment but something much more unusual. But in the book I think the call-centre is slightly different. Alice says to Dan early on that there are teams in the call-centre who work well, and teams in the call-centre who’ve gone rogue, as it were, and Dan’s team is a bad one. One of the things that’s different between the novel and the film is that the management of Quick Call in the film very much falls on the shoulders of Bryan, Alice’s ex-lover, whereas in the novel it’s a more mysterious environment. Quick Kall in the novel has several different floors, and Dan’s uncertain about what else is going on in the building and the Bryan of the novel has no real idea what’s going on either. If you could change one thing about the call centre, what would you change? The one thing I’ve never understood about call centres (at least in my experience of working at one and occasionally from calling them) is that why they don’t have more dedicated call-centres and furnish the people answering the phone with all the information they need to answer the callers’ needs. My experience of working in a call-centre was that I had to flip from one screen to another with no idea what I was talking about (for example, running through the specs of a car when I can’t even drive) and if the person calling asked me anything that wasn’t on the screen then I had no idea how to answer. Also, I think people should be paid more, given better job security and respected for what they’re doing. And…sorry, this is much more than one thing, employ more people and have more lines to reduce waiting time. Basically, I think that the importance of call-centres needs to be acknowledged and management should look at improving caller and employees’ experiences rather than hitting arbitrary targets or providing the cheapest possible service. Towards the end of last year I was approached by Dragonfly Television, makers of’One Born Every Minute, who are in the process of making a new documentary series about complaints and customer service in Britain. We’re interested in showing just what the toll of being on the end of a barrage of abuse can result in, our episode is going to be surrounding utility companies and at the moment they seem to really be at the very forefront of people’s vitriol. So we’d like to understand just how the decisions that are made at an executive level can have a negative effect not only on the customer but also the call centre worker themselves. 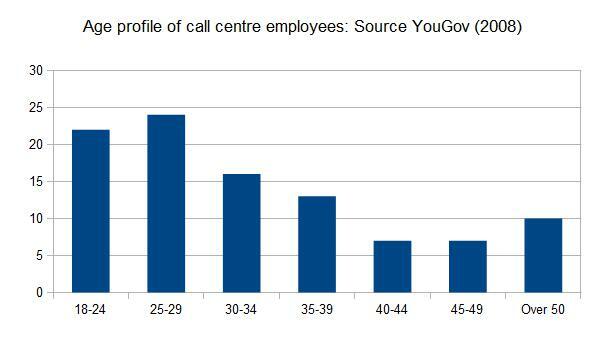 Turning Thirty in the Call Centre: What is the average age of call centre employees? I never expected to see in my 30th year in a call centre. If you’d have asked me where I’d have been now at the age of 18 I’d have pictured a job in middle-management somewhere with a comfortable salary, certainly enough to pay the mortgage on a nice suburban semi. Of course the BBC3 show the call centre didn’t help with it’s emphasis on the call centre as being young, funky and just a little bit spunky. According to the voiceover on the episode which I viewed out of the ‘1 million call centre workers in the UK’ the average age is just 26. But how true is this? The older I get the younger my colleagues seem to be, but I’ve also seen plenty of people older than me in the call centre and I have my suspicions about claims that the call centre is wholly a young persons environment. Call center jobs are often viewed as low skilled and clerical, and the workforce is portrayed as young and unattached to the labor force. According to our survey, however, the age and education profile of call center workers is considerably higher. The typical call center worker in this survey is 30 years old and has one and a half years of college education. Whilst this means the median age of a call centre employee would be around thirty plotted in a chart it is quite apparent how the age-profile is skewed towards the younger end of the age range. In terms of industry sector there is also some variation. 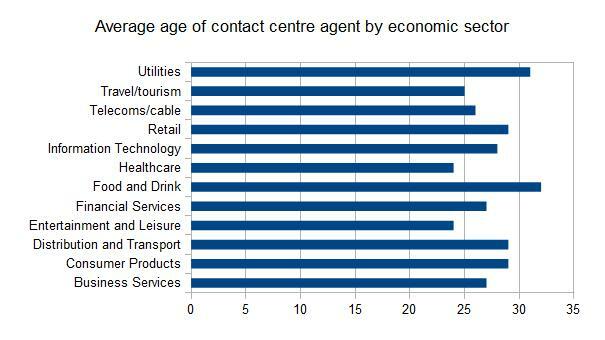 Using Data from a 2004 DTI report the CFA Business Skills @ Work Contact Centre Labour Market Report 2012 presents a break down of average age by industry sector. The average age varies from 24 for Healthcare and Entertainment & Leisure to 31 for Utilities and 32 for the category Food & Drink. In terms of identifying patterns, the DTI figures from 2000 draw on evidence from focus groups and site visits and further explanation illustrates that there were at that time several key groups of employees who were agents. The first of these groups was identified as young women under 30 who may not have higher educational qualifications but have significant length of service in the industry. Fewer young men are in that category. A second group is made up of returning workers and those looking for a new start after structural redundancy. This brings in a more mature group which raises the average age. A third group consisted of recent graduates or even students working part time who may not be seeing long term prospects in the industry. Newer qualitative evidence is provided by consultation and research undertaken in 2009. Focus groups and site visits indicated that the average age of agents was probably rising as was the average level of qualifications. This came about partly from changing labour markets and partly from the tendency for contact centres to handle more relationship-based work than early call centre routines, many of which have now been automated. Consultees confirmed that their recruitment focuses on candidates with greater life experience and the ability to form a rapport and relationship with a wide variety of clients. Despite the lack of quantified data, this information is clearly relevant to the overview of age of the workforce. In short there’s going to be a lot more of us turning thirty in the call centre.